On Friday afternoon (Aug 14), Walt Disney Animation and Pixar presented their upcoming slate of animated features. The presentation was kicked off by Alan Horn, Chairman of Walt Disney Studios. He showed a history reel of Disney/Pixar animation highlights, and explained how proud he was to be connected to the heritage and legacy of Disney animation — to have a connection to the people who invented the art form of feature animation. He further explained that when Ed Catmull and John Lasseter took over (as part of the acquisition of Pixar), the development model changed from an executive-driven process to a filmmaker-driven process. He then introduced John Lasseter (head of Pixar and Disney Animation) to take us through the films. I’ll cover Walt Disney Animation in this post, and Pixar in the post that follows. John explained that he’d always been a fan of animation featuring anthropomorphic animals — animals that wear clothes, use machinery, drive cars (he cited Mr. Toad as an example here). Zootopia is a film in that mode. Director Byron Howard (Tangled, Bolt), Director Rich Moore (Wreck-it Ralph) and Producer Clark Spencer came out to present a film clip. In the clip, Nick Wilde, a fox (voiced by Jason Bateman) is trying to con an ice cream shop owner out of a free ice cream for his son ( left the wallet at home … it’s the kid’s birthday … the poor kid is sick .. etc. ). Watching this is bunny Judy Hops (voice by Ginnifer Goodwin), who will later pair up with Wilde to solve a missing persons case. The area they inhabit is very richly designed, with different environs for the various types of animals — tunda, burrows, dunes, rainforest. Ginnifer Goodwin came out to give some background on her character — she plays a cop, and in this world cops are always the bigger, tougher animals. So as a bunny, she’s assigned to be a meter maid rather than getting the good assignments. So the missing persons case she is working (it wasn’t explained how that will come about) is going to be her big break. In another hilarious scene — where Nick and Judy are trying to get information from a DMV employee played, appropriately enough, by a sloth — it’s unclear whether Nick is really trying to help or hinder the investigation. We had a very brief video from Shakira, who played just a few seconds of her song Try Everything from the movie. She is also playing the character of a gazelle. Zootopia will be released March 4th 2016. Lasseter to returned to the stage to explain how, whenever Disney does a fairy tale story, it tends to become the definitive version of that tale. Many of the Disney stories had been told and re-told in many different forms before Disney’s version. So, Lasseter announced that Disney is now setting out to tell the definitive version of the Jack and the Beanstalk story. The movie will be titled Gigantic, with a release date of 2018. Nathan Greno (Tangled) will direct, and Dorothy McKim will produce. The film is set in Spain during the Age of Exploration. We heard that when Jack goes up the beanstalk, he encounters not just a single giant, but a whole community of giants. In particular it appears he becomes the plaything of one young girl (Inma – not sure about the spelling). Bobby Lopez and Kristina Anderson-Lopez (Frozen) will create the songs for the movie. They came out on stage and Kristina sang “Little Man” from the film while storyboards for that sequence were shown. No casting was announced. The movie is scheduled for a 2018 release. John Musker and Ron Clements (The Great Mouse Detective, The Little Mermaid, Aladdin, Hercules, Treasure Planet, The Princess and the Frog) directing, Osnat Shurer producing. 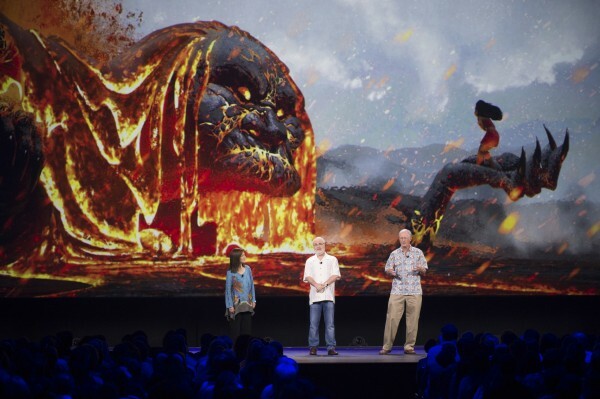 Moana directors John Musker and Ron Clements. Image (c) D23.com. This tale is set in the South Pacific. The islanders in this region, historically, have been some of the greatest navigators in the world. Yet, for some unknown reason, about 2000 years ago they stopped exploring and basically stayed at home for a thousand years. Then, about 1000 years ago, they resumed their seafaring ways. This story sets out to tell us why. Teenager Moana longs to explore the ocean, but her father doesn’t want her (or anyone) to venture past the reef-protected immediate vicinity of their island. She is encouraged and motivated by her grandmother. She is also inspired along the way by a demi-god, Maui, played by Dwayne Johnson. At this point Dwayne came out and told us more about his character. A clip was played where he tries to impress Moana. The character Maui is covered with tattoos, which will animate to tell about his deeds. He carries a giant fishhook with which he can pull islands up from the ocean floor. Dwayne Johnson. Image (c) D23.com. We saw a clip where Moana, as a young girl (about 2), meets the ocean for the first time. This is a beautifully animated sequence in which the ocean has real personality — it teases Moana by withdrawing to reveal shells, and as she moves forward to collect the shells, the ocean forms a wall around her, creating a virtual aquarium where she can see the sea life around her. A wave then gently carries her back to the beach. A Polynesian musical number was then performed by a large group of singers and dancers; I’m not sure if this was actual music from the movie or just to show the general tone, but it was beautiful and should be amazing when paired with animation like the preview we were shown. Those are the upcoming films from Walt Disney Studios feature animation … Pixar will be covered in the next post, and the live-action releases (Disney, Marvel, and Lucasfilm) in the posts that follow. 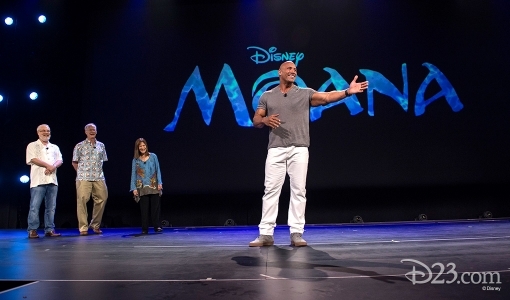 This entry was posted in Animation, D23, D23 Expo 2015, Disney, Pixar and tagged Alan Horn, Byron Howard, Clark Spencer, Dwayne Johnson, Gigantic, Ginnifer Goodwin, Jason Bateman, John Lasseter, John Musker, Moana, Rich Moore, Ron Clements, Zootopia. Bookmark the permalink.